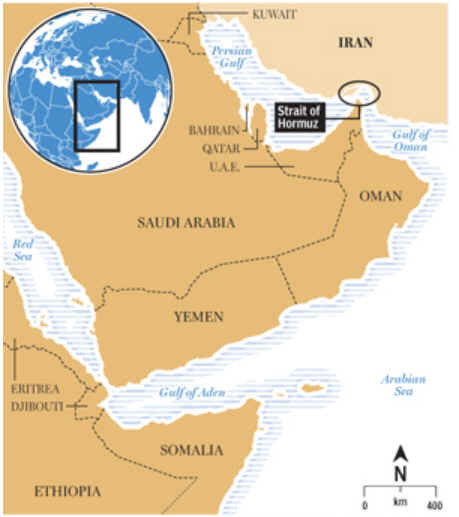 January 4, 2012 The U.S. Energy Information Administration (EIA) -The Strait of Hormuz (shown in the oval on the map), which is located between Oman and Iran, connects the Persian Gulf with the Gulf of Oman and the Arabian Sea. Hormuz is the world's most important oil chokepoint due to its daily oil flow of almost 17 million barrels per day (bbl/d) in 2011, up from between 15.5-16.0 million bbl/d in 2009-2010. Flows through the Strait in 2011 were roughly 35% of all seaborne traded oil, or almost 20% of oil traded worldwide. On average, 14 crude oil tankers per day passed through the Strait in 2011, with a corresponding amount of empty tankers entering to pick up new cargos. More than 85% of these crude oil exports went to Asian markets, with Japan, India, South Korea, and China representing the largest destinations. At its narrowest point, the Strait is 21 miles wide, but the width of the shipping lane in either direction is only two miles, separated by a two-mile buffer zone. The Strait is deep and wide enough to handle the world's largest crude oil tankers, with about two-thirds of oil shipments carried by tankers in excess of 150,000 deadweight tons. Several alternatives are potentially available to move oil from the Persian Gulf region without transiting Hormuz, but they are limited in capacity, in many cases are not currently operating or operable, and generally engender higher transport costs and logistical challenges. •Alternate routes include the 745-mile Petroline, also known as the East-West Pipeline, across Saudi Arabia from Abqaiq to the Red Sea. The East-West Pipeline has a nameplate capacity of about 5 million bbl/d, with current movements estimated at about 2 million bbl/d. •The Abqaiq-Yanbu natural gas liquids pipeline, which runs parallel to the Petroline to the Red Sea, has a 290,000-bbl/d capacity. •Additional oil could also be pumped north via the Iraq-Turkey pipeline to the port of Ceyhan on the Mediterranean Sea, but volumes have been limited by the closure of the Strategic Pipeline linking north and south Iraq. •The United Arab Emirates is also completing the 1.5 million bbl/d Abu Dhabi Crude Oil Pipeline that will cross the emirate of Abu Dhabi and end at the port of Fujairah just south of the Strait. •Other alternate routes could include the deactivated 1.65-million bbl/d Iraqi Pipeline across Saudi Arabia (IPSA) and the deactivated 0.5 million-bbl/d Tapline to Lebanon.